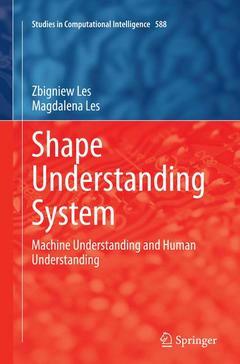 This is the third book presenting selected results of research on the further development of the shape understanding system (SUS) carried out by authors in the newly founded Queen Jadwiga Research Institute of Understanding. In this book the new term Machine Understanding is introduced referring to a new area of research aiming to investigate the possibility of building machines with the ability to understand. It is presented that SUS needs to some extent mimic human understanding and for this reason machines are evaluated according to the rules applied for the evaluation of human understanding. The book shows how to formulate problems and how it can be tested if the machine is able to solve these problems. Understanding.- Understanding Systems.- Machine Understanding – Human Understanding.- Machine Understanding – Human Understanding.- Categories.- Problem Solving.- Visual Understanding.- Understanding Signs.- Understanding Text.- Understanding Explanations. Disponible chez l'éditeur (délai d'approvisionnement : 15 jours). sciences cognitives appliquées à l'informatique: langage naturel, sémantique, linguistique.